Here is a small, easy to use guide on Silhouette Photography with your DSLR cameras. History of the silhouette dates back to the 18th century. Silhouette refers to the outline or the contour of an area or the area enclosed by the contour surface that is dark with a light background or vice versa. This can be a natural contour like for example, the shadow of a human body or building on the background of the sky or artificial for example, a drawing or a shadow silhouette. The later artificial silhouette is not termed as silhouette. We often do this on Adobe Photoshop for creating a shadow of an object. In this article, we will discuss about Silhouette Photography in brief, just as much you need for day to day work. We have two evergreen articles for the new DSLR users – What Camera Mode to Choose Depending on the Situation and Manual Mode of DSLR. They are hugely popular for the easy to remember infographics. If you are wanting a person to appear as a black silhouette with an evening sky as background, the easiest way to do this is to expose for the sky – you could meter for the sky and lock the exposure and then change the composition. It depends on how light the sky has, if the person do not become pitch black, either you have to underexpose even more (you can use compensation) or edit in Photoshop or Gimp later. Results depends on how you work – result from full Auto, Aperture Priority, Shutter Priority or M(annual) will be different. In this context, you can read How to Set ISO to Get Pictures Rightly Exposed Without Noise. It is very difficult to precisely tell any settings as the Lens and focal length are the big variables. You can try by setting your camera to spot meter mode, then find or assign a button on your camera to lock in the exposure settings from that reading. It will be AE/AF, with most of the entry-level DSLR’s you may have to assign a function button to AE (auto-exposure) lock. Once you hold the camera up to the sky to get your meter reading, hold down your AE-lock button, recompose the picture with your silhouette where you want it, half-press the shutter to focus and take the shot. Backlight : Your sky or artificial light on the background. It is exactly the opposite of what we normally shoot. The subject will have almost zero visible light on it. Metering the background : Normally we do not work in this way. Spot or centre-weighted metering. Focusing : Without a sharp focus on the subject, the photo will get fully messed up. Shape : Objects with too fine outline is not actually suitable and will tend to low light photography. No Flash : It is probably obvious that Flash should be forced to OFF. This Article Has Been Shared 2813 Times! Here are Some Way of Thoughts Which Will Simplify the Learning Curve in Street Photography. Photography essentially is a form of visual art. Lens speed means the maximum aperture diameter a particular lens can have. As f-number is reverse, it becomes the minimum f-number of a photographic lens. 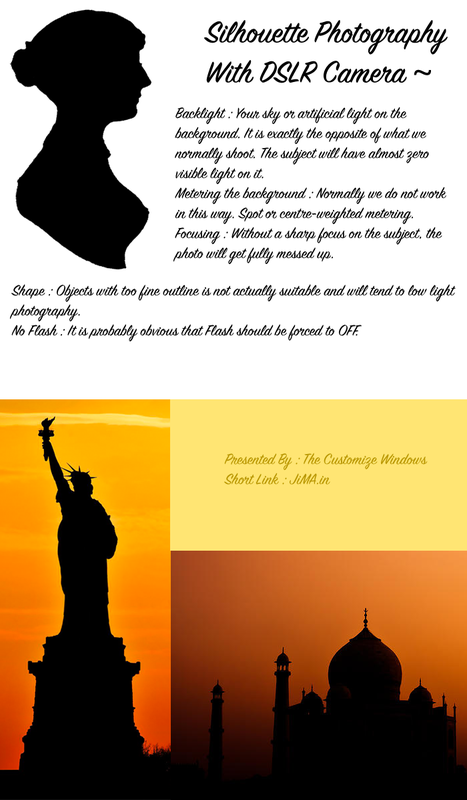 Cite this article as: Abhishek Ghosh, "Silhouette Photography With DSLR," in The Customize Windows, April 11, 2015, April 21, 2019, https://thecustomizewindows.com/2015/04/silhouette-photography-with-dslr/.